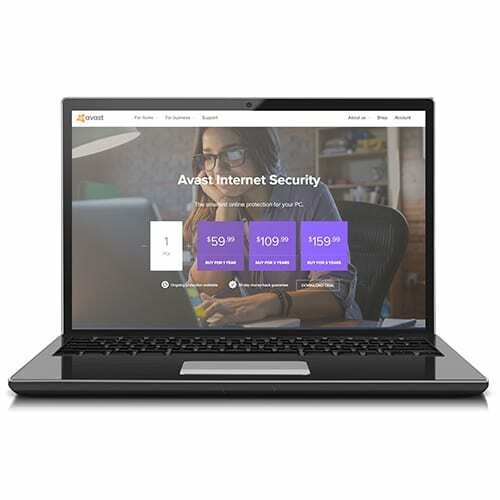 Avast Internet Security is a step up from the company’s Pro Antivirus plan, with additional features like a robust firewall, anti-spam filter, and secure browser for online activity. Avast Internet Security is an antivirus suite designed to protect your PC from malware, ransomware, adware, and other threats to your hard drive. The program works using artificial intelligence (AI) technology to recognize specific software signatures and behavior patterns of dangerous programs and files. When an unsafe item is detected, it is placed in the “Virus Chest,” a quarantine area safe from the rest of your computer. From the Virus Chest, you can choose to either mark a program or file as safe or have Avast remove it from your computer. Avast Internet Security’s additional features go beyond basic protection from viruses to extend your security to your online experience. Its email shield works with your email program to keep you from accidentally sending or downloading malware. The browser extension makes sure you’re not landing on any potentially dangerous websites. You can even create your own secure browser to keep you safe during internet banking and shopping. Avast offers a free thirty-day trial of the Internet Security software so you can try before you buy. If you do purchase the software and you’re not happy with it, Avast offers a thirty-day money-back guarantee. Automatic renewal isn’t always a good thing, but antivirus software is like health insurance: you don’t want to be caught without it. Avast’s yearly auto-renewal ensures there’s no lapse in protection for your PC, but you can also opt out at any time. Avast will let you increase your Internet Security subscription to include additional devices as needed, but there is an additional charge. Avast doesn’t offer mobile device protection with the Internet Security suite, but you can go online and download a version of Avast Free Antivirus to protect your Android device. Most antivirus software suites include settings to prevent kids from accessing inappropriate content online, but you’ll have to purchase a pricier package if you want this service from Avast. At this price point, we’d hope to see a data shredder included with the package, but like the parental controls, you’ll have to pay for an upgrade to get this feature. Avast has several additional features that go above and beyond a standard antivirus program. While some are useful—like the Sandbox and Browser Cleanup—others, like SafePrice, have little to do with security and can be annoying. While many other antivirus software firewalls work by either allowing nothing in or nothing out, the Avast firewall uses a more sophisticated system of rules that allow it to decide what passes through. This is a smarter approach that still provides top-notch protection. Avast’s Sandbox feature allows you to test out new software in a separate, protected space on your computer before it interacts with the rest of your hard drive, so you can make sure it’s safe. If you’ve ever worried about strangers using your wireless network, Avast’s Wi-Fi protection will stop them in their tracks, and it monitors for hackers on hardwire networks as well. Most email providers offer spam filters as part of their services, but few offer customization options like the ones available through Avast. With Avast, you can adjust the strength of the filter and automatically whitelist email addresses you send mail to. If you’re not careful during installation, you might end up with a lot of Avast pop-ups for additional features like Software Updater and SafePrice. Fortunately, you can disable most of these by either clicking “customize” before installation begins or by going to the Preferences tab in the program. Putting Avast in Game Mode can also solve the problem. Downloading Avast is pretty straightforward. We did find a few glitches with installation, but they’re easily fixed. Avast is quick to download, and most users find it easy to install. Several customers complain that even though they bought a one- or two-year license for the program, their installation screen shows that they only have a thirty-day license. We looked into this issue and learned that you need to enter your product code into the program in order for it to update the license. Avast has one of the lightest touches on the market when it comes to quietly doing its job without interfering with your computer experience, but its scans may run longer than expected. If Avast catches any suspicious threats that it doesn’t recognize, it sends them to its virus lab in the cloud for analysis. If the lab identifies one of these threats as malware, it notifies all Avast users. Not only does this keep your antivirus software current, it also adds more layers of protection. Your computer will still run at normal speeds, even while running the Avast antivirus software. Avast blocked 99.6% of malware with only one false positive, and it blocked 100% of malware encountered online—this is according to tests from April 2018, run by the independent testing organization AV Comparatives. It received three out of three stars and an Advanced+ rating for both protection and performance. The only downside to Avast’s light touch on PCs is its longer scan times. Expect the scans to run longer than some competitors. A VPN (virtual private network) encrypts your connection, allowing you to be completely anonymous whenever you connect to any device. This keeps you safe from advertisers and others who try to track your online activities, and it also gives you added protection when using public Wi-Fi. Does the Avast Internet Security suite include VPN protection? No, but you can purchase it as an add-on to the Internet Security package by buying Avast SecureLine VPN. SafePrice is a deal alert feature that automatically installs on your browser when you set up Avast Internet Security. When Avast notices you shopping online, it will automatically start to search for a better deal for you. If you want to remove this feature, you can disable it under Preferences without affecting Avast’s protective features. Does Avast Internet Security include password protection? Yes, Avast includes a password manager that allows you to create a single secure password for all of your accounts, but its features are limited. For additional features like one-touch login and Password Guardian, you can upgrade to a more robust Avast Passwords Premium for an additional fee. Avast Internet Security is a proven choice for those who want to go beyond free antivirus programs and add the protection of a robust firewall and online security features. Its simple download, user-friendly interface, and light impact make it low-key enough for anyone to use, but its SafeZone browser and Sandbox features open up additional possibilities for the more adventurous. To write our Avast software review, we studied Avast’s independent test scores, read numerous online reviews from a variety of sources, and tried Avast’s software for ourselves. To learn more about how we review products, check out our methodology.